DHCP, or Dynamic Host Control Protocol, is the service used to hand out IP addresses and other network settings by network appliances and servers. 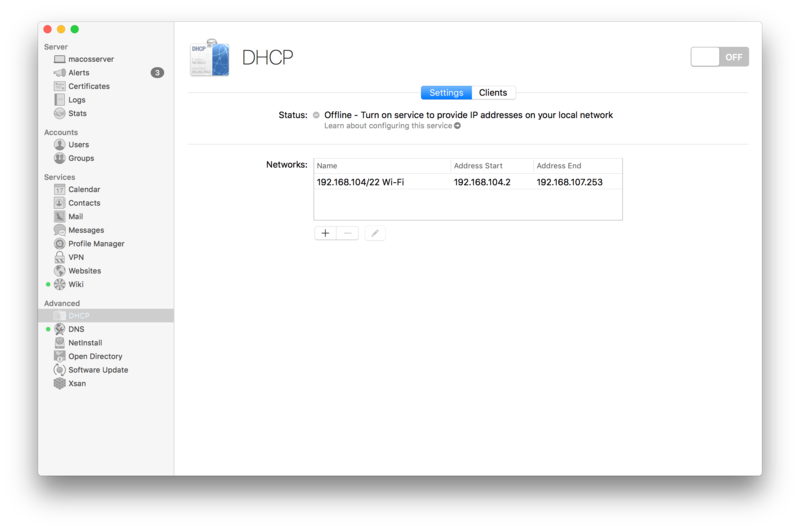 The DHCP Server built into macOS Server 5.4 on High Sierra is similar to the DHCP service that was included in Server 10.2 and 10.2 and from the good ‘ole Panther days. It’s pretty simple to use and transparent, just as DHCP services should be. To install the service, open the Server app and then click on the Show button beside Advanced in the server sidebar. Then click on DHCP. At the DHCP screen, you’ll see two tabs: Settings, used for managing the service and Clients, used to see leases in use by computers that obtain IP address information from the server. You’ll also see an ON and OFF switch, but we’re going to configure our scopes, or Networks as they appear in the Server app, before we enable the service. To configure a scope, double-click on the first entry in the Networks list. Name: A name for the scope, used only on the server to keep track of things. Lease Duration: Select an hour, a day, a week or 30 days. This is how long a lease that is provided to a client is valid before the lease expires and the client must find a new lease, either from the server you’re configuring or a different host. Network Interface: The network interface you’d like to share IPs over. 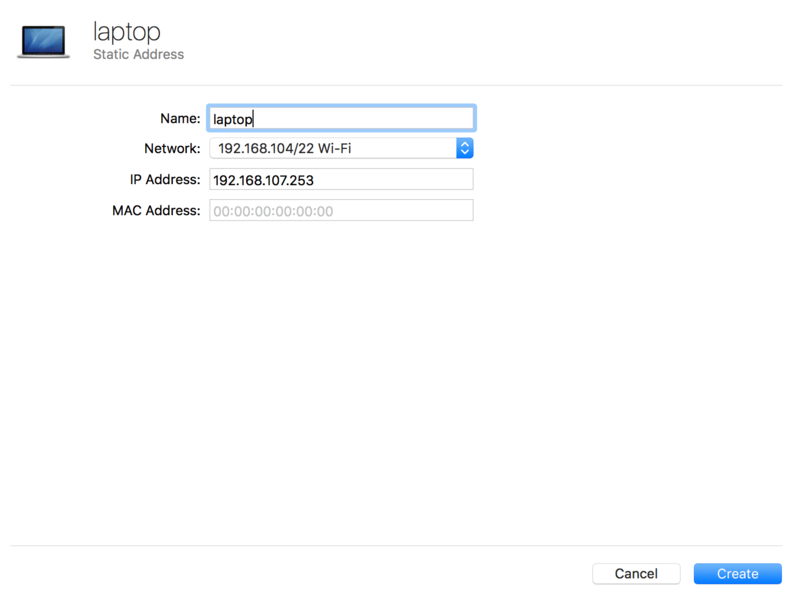 Keep in mind that you can tag multiple VLANs on a NIC, assign each an interface in OS X and therefore provide different scopes for different VLANs with the same physical computer and NIC. Starting IP Address: The first IP address used. For example, if you configure a scope to go from 192.168.210.200 to 192.168.210.250 you would have 50 useable IP addresses. Ending IP Address: The last IP address used in a scope. Subnet Mask: The subnet mask used for the client configuration. This setting determines the size of the network. Router: The default gateway, or router for the network. Often a .1 address for the subnet used in the Starting and Ending IP address fields. 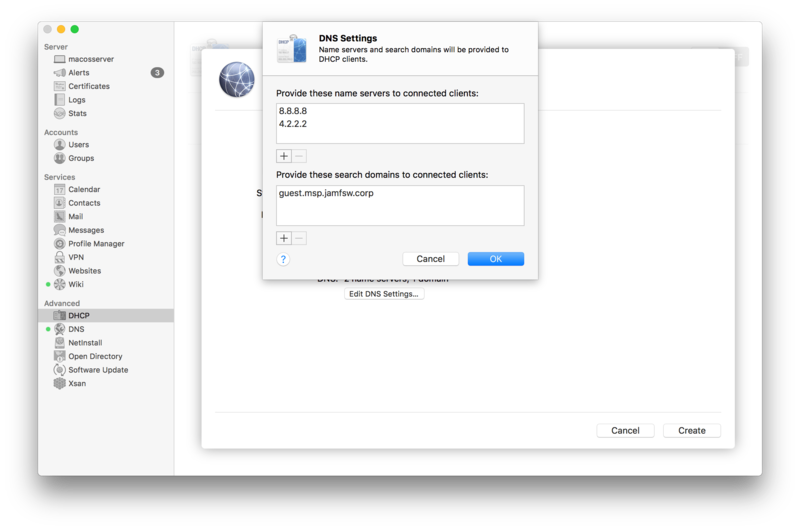 Note that while in DHCP you don’t actually have to use a gateway, OS X Server does force you to do so or you cannot save changes to each scope. DNS: Use the Edit button for DNS to bring up a screen that allows you to configure the DNS settings provided as part of each DHCP scope you create, taking note that by default you will be handing out a server of 0.0.0.0 if you don’t configure this setting. The DNS settings in the DHCP scope are really just the IP addresses to use for the DNS servers and the search domain. The search domain is the domain name appended to all otherwise incomplete Fully Qualified Domain Names. For example, if we use internal.krypted.lan and we have a DNS record for wiki.internal.krypted.lan then we could just type wiki into Safari to bring up the wiki server. Click the minus sign button to remove any data in these fields and then click on the plus sign to enter new values. Click OK to save DNS settings and then OK to save each scope. Once you’ve build all required scopes, start the service. Once started, verify that a new client on the network gets an IP. Also, make sure that there are no overlapping scopes and that if you are moving a scope from one device to another (e.g. the server you’re setting up right now) that you renew all leases on client systems, most easily done using a quick reboot, or using “ipconfig /release” on a Windows computer. If you have problems with leases not renewing in macOS, check out this article I did awhile back. So far, totally easy. Each time you make a change, the change updates a few different things. serveradmin settings dhcp:logging_level = "MEDIUM"
serveradmin settings dhcp:subnets:_array_id:B03BAE3C-AB79-4108-9E5E-F0ABAF32179E:net_range_start = "192.168.210.202"
This output includes the number of active leases, path to log file (tailing that file is helpful when troubleshooting issues), static mappings (configured using the command line if needed), etc. dhcp:timeOfModification = "2017-9-04 04:24:17 +0000"
dhcp:timeOfSnapShot = "2017-9-04 04:24:19 +0000"
dhcp:timeServiceStarted = "2017-9-04 04:24:17 +0000"
You can also add DHCP Reservations, or static maps. To do so, click on the clients tab and then click on the plus sign (“+”). From here, you can add a hostname and IP address to a given MAC address in order to allow that MAC address to always be assigned the IP you’d like. Finally, you can define DHCP options in /etc/bootp.plist. This process isn’t necessarily support, there is no GUI control for options, and options are not as widely used with devices as they once were. However, it’s absolutely an option if needed.